Chocolate Chip Cookie Cups From: Meghan Belton for the cookie party! Sift flour, baking soda and salt together in the small mixing bowl. Combine butter, vanilla extract, white and brown sugar in the large mixing bowl until smooth and creamy. Add eggs to the large bowl and beat well. Slowly add the flour mix and beat evenly. Stir in the chocolate chips. With a spoon or a small ice-cream scoop, scoop the cookie dough into a greased muffin tray. Fill each cup about 3/4 full. 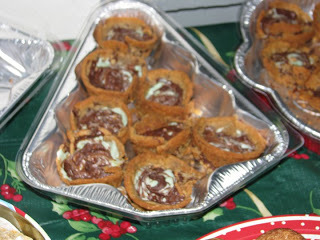 Using a the back of a spoon, push in the center of each cookie-dough ball in the muffin cups to form “Cookie Cups”. Cook for about 8 to 10 minutes. After removing the cookies, using the back of the spoon again to reshape the “cup form” for the middle of the cookie as it may have “poofed” a little. As soon as you do this, sprinkle the extra chocolate chips into the center of each cookie cup. The hot cookies will melt the chips a little. Let the cookies cool, remove from the muffin tins and enjoy!